An analytical model for the prediction of the thermoelastic properties of composite laminates containing matrix cracks is presented. In particular, transverse matrix cracks with their crack surfaces parallel to the fibre direction and perpendicular to the laminate plane are treated. Two- and three-dimensional laminates of arbitrary layup configurations are covered by the model. 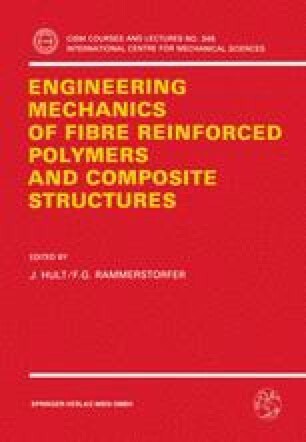 The presented expressions for stiffnesses, thermal expansion coefficients, strain contributions from release of residual stresses and local average ply stresses and strains do solely contain known ply property data and matrix crack densities. The key to the model is the judicious use of a known analytical solution for a row of cracks in an infinite isotropic medium. The model has been verified against numerically determined stiffnesses, thermal expansion coefficients and local average ply stresses for matrix cracked angle-ply and cross-ply laminates. Comparisons to experimental data for cross-ply laminates are also presented. It is shown that the present model to a very good accuracy can predict thermoelastic properties of matrix cracked composite laminates at varying matrix crack densities and layup configurations.